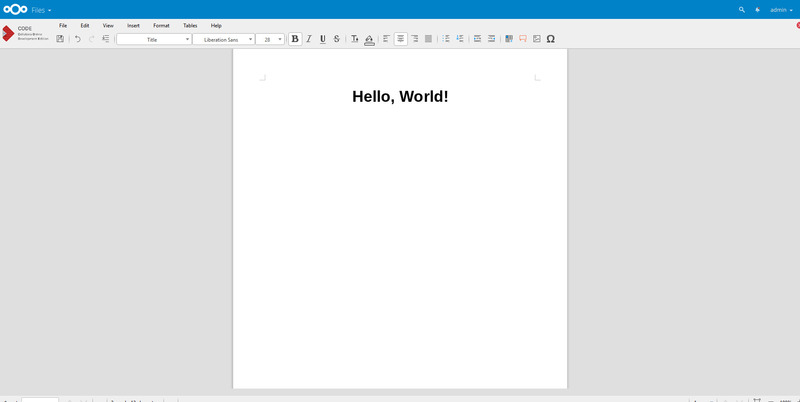 Collabora Online is a full-fledged, web-accessible office suite based on LibreOffice. By integrating Collabora Online with NextCloud, you will be able to create and edit documents directly from NextCloud. Let’s take a look at how to do it. This guide will guide you through the installation of NextCloud and Collabora Online on the same host using Docker and Nginx as reverse proxy. I will assume you already have a fair understanding of NextCloud and Nginx. Installing Collabora Online without domain/SSL: this is a testing purpose tutorial and it is discouraged in production. Installing Collabora Online with domain/SSL: this is the official way to do things, but you will require a resolvable domain name and a valid SSL certificate. How to install NextCloud 11 on Ubuntu 16.04. How to install NextCloud 11 on Centos 7. The only requirement is to have Docker and Nginx installed on your machine. If you don’t have them installed, you can easily search for a guide or refer to your distribution’s knowledge base. This setup is intended to be used for testing and proof of concept purposes only. It is insecure to say the least. Port 9980 which is used by Collabora is exposed and should be protected against attackers. Without SSL the communication is unencrypted and could be read by anyone in the middle. $ docker exec -it collabora_nextcloud /bin/bash -c "apt-get -y update && apt-get -y install xmlstarlet && xmlstarlet ed --inplace -u \"/config/ssl/enable\" -v false /etc/loolwsd/loolwsd.xml && xmlstarlet ed --inplace -u \"/config/ssl/termination\" -v false /etc/loolwsd/loolwsd.xml"
In this example I used port 8080 but you are free to use whatever you feel like. Be sure however not to use ports used by other services (NextCloud itself). So, no 80, no 443. Whatever your choice is, remember to set up the firewall you’re using (it depends on your configuration and/or distribution). As admin, go to Apps -> Productivity -> Collabora Online; download and enable. Go to Admin -> Collabora Online and insert the IP address of your machine. This setup is more secure compared to the precedent. This one, however, requires that you (and the client thats are going to use the service) are able to resolve the domain name of the host properly. You will also need a subdomain for your host (e.g. office.example.com) . You also need a valid SSL certificate (self-signed is probably possible, but I haven’t tried and would probably be a little troublesome). Be sure to use double backslashes when escaping dots in your domain. Remember to set up the firewall you’re using (it depends on your configuration and/or distribution). Go to Admin -> Collabora Online and insert the sub-domain name you have assigned to the Collabora instance. So if you used host.example.com you will fill the field with: https://host.example.com . You now know how to integrate the Collabora Online suite with NextCloud, allowing documents, spreadsheets and presentations to be created and edited directly from Nextcloud. Thanks to this post for the nginx configuration.